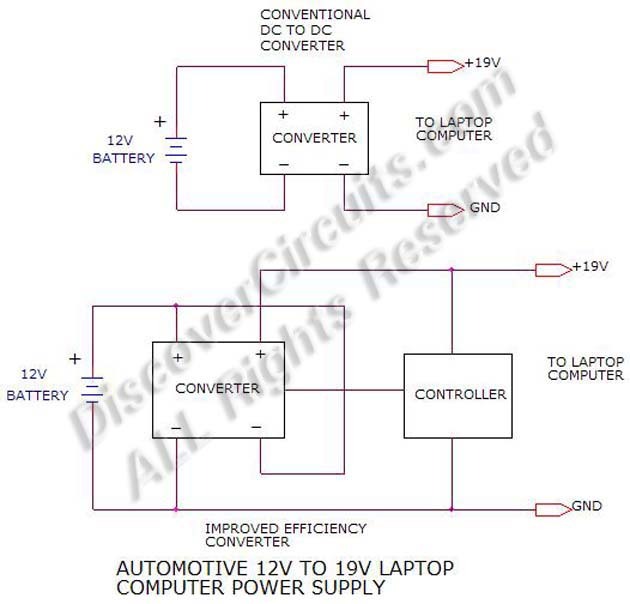 Circuit: 12v to 19v Laptop Power Supply (Concept)__ Circuits designed by David A. Johnson, P.E. I have a big screen HP laptop computer. The large brick size AC to DC power supply is rated at 19.2v and 9.5 Amps, which is about 180 watts. I’d like to be able to use the thing in my car. I looked into a 12v car adapter for it but never really found one that I liked. Most were underpowered. The other option was to use the existing AC to DC adapter and run it off power from a 12v to 120vac inverter. This would work but it is rather bulky and inefficient. If I were going build my own supply, I would take a different approach. The typical automotive DC voltage varies from about 12v to 14 volts. This is too low to power the DC input of the laptop but it is not too far off. My thought would be to design a DC to DC converter, whose output voltage would ride on top of the automotive 12v to 14v cigarette lighter supply. This allows the voltage boost circuit to be smaller, since it only has to generate 5v to 7v with a current of about 10 Amps. The converter would need to be an isolated type and a simple control circuit would need to be added. That circuit would monitor the output and control the converter supply voltage in response to load and car battery voltage variations. The result should be a much smaller supply with a much higher efficiency. If a 180 watt DC to DC converter were used to power the laptop, with an efficiency of about 85%, it would dissipate about 30 watts of power. But, using my concept, the smaller converter would only dissipate 12 watts. Overall, this would move the efficiency, when viewed by the 12v cigarette lighter supply, to about 94%.